This third implementation of brick sorter was originally created to test my color sensor. 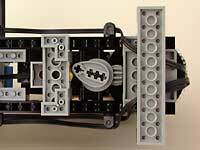 But of course it can be equipped with regular light sensor with limited sorting capability. 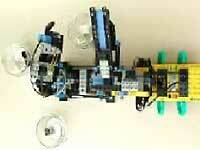 It's construction uses only parts included in Robotics Invention System and Ultimate Builders Set. The brick chute holds the 2x2 bricks to be sorted. Gravity lets them go down as they are removed from bottom of stack. 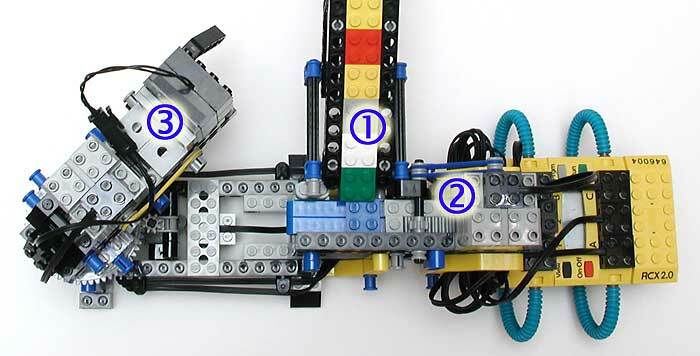 The rotating arm carries the color sensor and a brick ejector that pushes bricks in output bins. 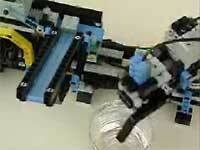 The finger out of arm closes the contact of a touch sensor in neutral position. 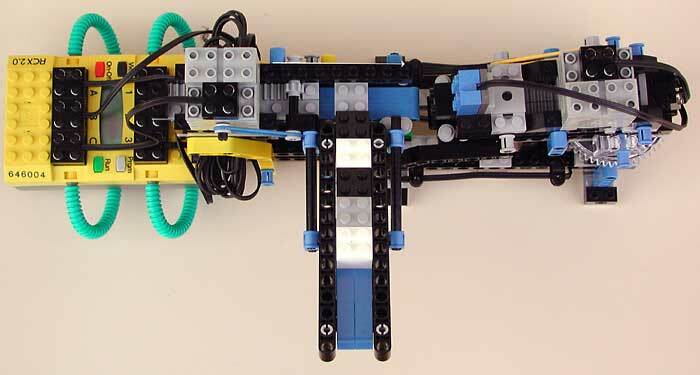 This bottom view shows the cam of rotating arm and touch sensor. They provide 6 different positions for plus neutral so we can sort 6 different colors. Sorter 3 equipped with color sensor and brick chute extension. Update : I forgot to provide LeoCad files, they are here. Sorter3-fixed_order: this program is for Sorter3 equipped with light sensor. Black bricks are placed in the first bin, grey one in the second, white bricks in the third. The thresholds between colors are fixed in the program and need to be modified according to your light sensor sensitivity. 8 bricks are sorted. Sorter3: Much more ambitious program, this one gets the first three bricks in the chute and measures their brightness (with light sensor). The order of these bricks determines the sort order. Clearly we reach here the limits of RIS 2.0 programming environment: the lack of arrays yields a complicated sorting tree (see screen capture), and I had to resort to dirty tricks to get round a strange restriction: the number of instructions in a program stack is limitated !!! 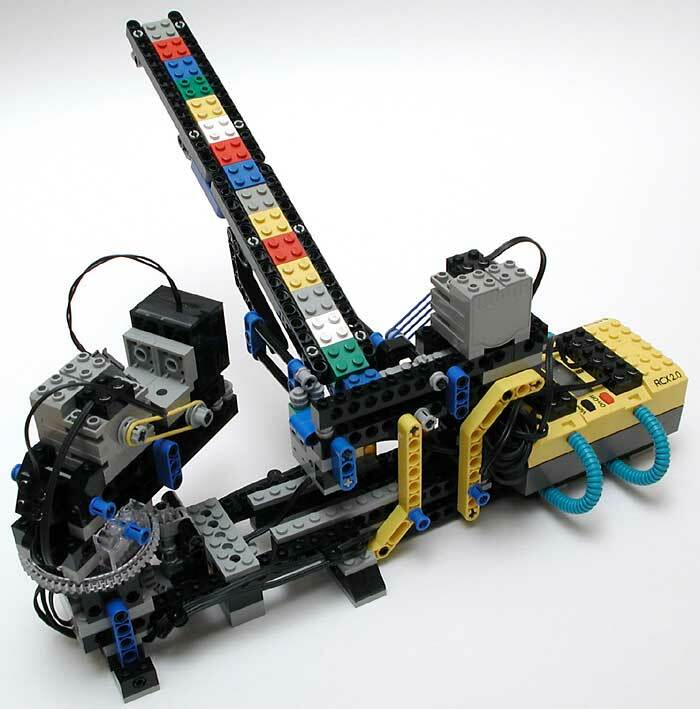 Byron sent me his NQC version of Sorter3 program, using a rotation sensor for positioning. For the color sensor version of the program, I went back to ... There are the limitations mentioned above, plus the impossibility of switching a sensor port between active and passive mode, the key to color sensor working. Sorter3-color_sensor works like sorter 3 except that it can sort 6 different colors instead of 3. Moreover, if no black bricks are used, the sorter halts automatically when the supply is empty (background is black). 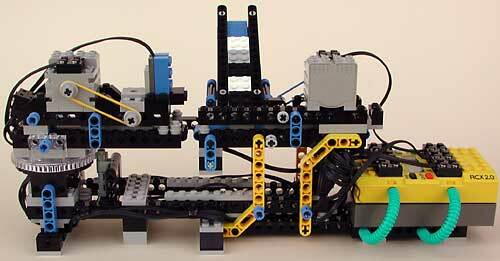 Brick sorter 3 with light sensor (350k). Brick injection end ejection (90k). 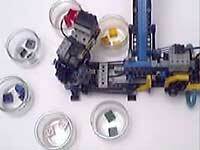 Brick sorter 3 with color sensor, accelerated movie (650k).